Efficiency of Foliar Application of Humic Acid on Improve Absorb of K than Na and Salt Tolerance in Petunia Hybrida L.
Rahimian Boogar, A., Gholamalizadeh Ahangar, A., Shirmohamadi, E. (2014). Efficiency of Foliar Application of Humic Acid on Improve Absorb of K than Na and Salt Tolerance in Petunia Hybrida L.. International Journal of Advanced Biological and Biomedical Research, 2(Issue 4 (2)), 256-259. A. Rahimian Boogar; A. Gholamalizadeh Ahangar; E. Shirmohamadi. "Efficiency of Foliar Application of Humic Acid on Improve Absorb of K than Na and Salt Tolerance in Petunia Hybrida L.". 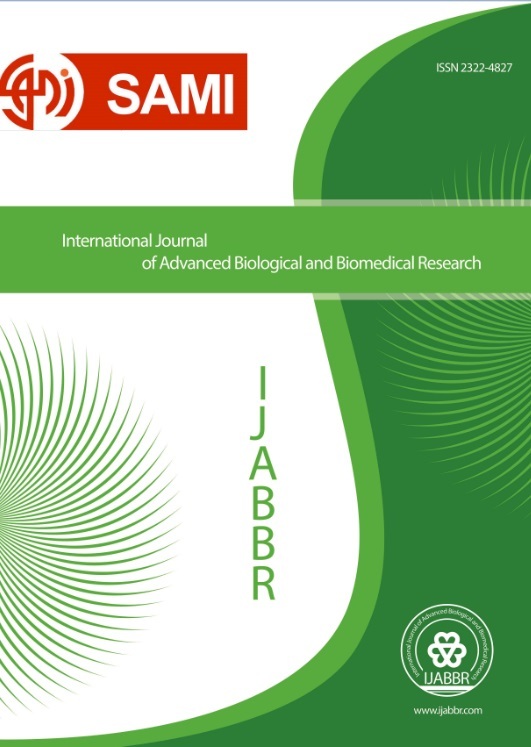 International Journal of Advanced Biological and Biomedical Research, 2, Issue 4 (2), 2014, 256-259. Rahimian Boogar, A., Gholamalizadeh Ahangar, A., Shirmohamadi, E. (2014). 'Efficiency of Foliar Application of Humic Acid on Improve Absorb of K than Na and Salt Tolerance in Petunia Hybrida L.', International Journal of Advanced Biological and Biomedical Research, 2(Issue 4 (2)), pp. 256-259. Rahimian Boogar, A., Gholamalizadeh Ahangar, A., Shirmohamadi, E. Efficiency of Foliar Application of Humic Acid on Improve Absorb of K than Na and Salt Tolerance in Petunia Hybrida L.. International Journal of Advanced Biological and Biomedical Research, 2014; 2(Issue 4 (2)): 256-259. Salinity is a major limitation ecological factor for plant development in arid and semi-arid regions. The ionic imbalance, deficiency of nutrients and degradation of plant metabolites are caused by saline conditions, are affected by the reduction ratio of potassium (K) then sodium (Na). In this research foliar applications of humic acid (HA) for improve the absorption of K under salt stress was applied at 100, 300,600 and 900 ppm with control treatment. Experiment was conducted in a randomized complete block design with three replications. Data’s analyzed with spss-19 and means were compared by LSD test. Evaluated characteristics are K and Na concentration, and ratio of K then Na in root, stem and leaf. Analyses of variance results are showed the foliar application of HA have a significant effect on K and Na concentration, and ratio of K then Na in different organs of petunia hybrida L., (P < 0.01). Results of means compare are showed the significant effect of HA on K and Na absorption, and the highest absorb of K and lowest absorb of Na were obtain at 600 and 900ppm of HA. So, highest ratio of K than Na is obtained at 900ppm.